Walk with God all day long, meditating on His Word in Song. Are you looking for KJV Bible songs that will elevate your thoughts to the courts of heaven? Scripture Songs that will give you great peace and joy? 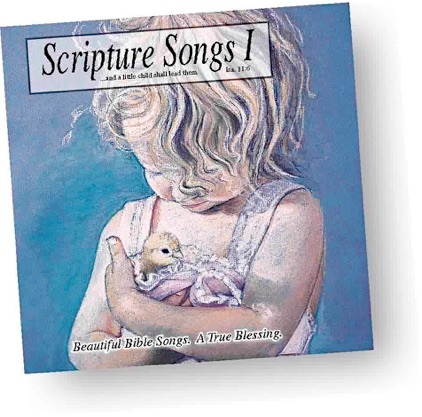 Folk Bible songs that your children will love and memorize for a lifetime of blessing! * KJV Bible passages sung to beautiful music. * Bible promises come alive. * Enjoyed by the entire family. * Simple, powerful, and extremely spiritual. Thousands of families have been drawn closer to God through this music, Yours can too. “I want to thank you for the myriad of blessings your inspired music has brought to my soul.” U.S.
“Thank you so much for Scripture Songs! It’s terrific to have good KJV music!!! U.S.
“I really like these KJV Scripture Songs.” U.S.
“Thank you! Thank you! I was so excited to find your Scripture Songs CD's. “I have listened to the Scripture Songs for many years. Praise God for the power of His word in our lives.” U.S.
What People Are Saying About Scripture Songs.